Appearance - Starts out with some chill haze out of the fridge that goes away after the beer warms up. It is a beautiful orange-gold with a big creamy white head that fades fast. Aroma - Starts out floral with a mild urinal, which is a big improvement over the last tasting. As it warms a bit of warm toasted bready malt comes through. 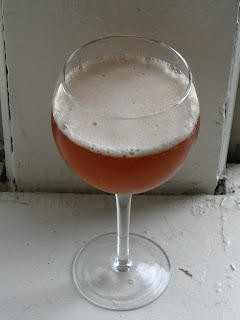 There is also a hint of citrus which must be from the Brett because there were no finishing hops. Taste - Lots of apple cider with a distant tartness. There is a hint of urinal here as well, but it is certainly a background note. The malt backbone is there without being sweet. Good balance, but I'd still like more sourness (hopefully my adjustments to the recipe the second time around will fix this). Mouthfeel -Mild prickly carbonation, medium body. I think I could have gone with higher carbonation, still no sign that the Brett is continuing to attenuate. Drinkability/Notes - This one is finally starting to turn the corner. Still pretty in your face funky, but it really has gotten much more pleasant. I didn't have to stop myself from grabbing another one, but I think this one could be doing really well in another few months.